Join Australia's best quality share market social network to discuss - G8 EDUCATION LIMITED and other ASX listed companies. Following on from my post on GEM on 6th January, after reading their latest annual report released today, I see nothing has changed. 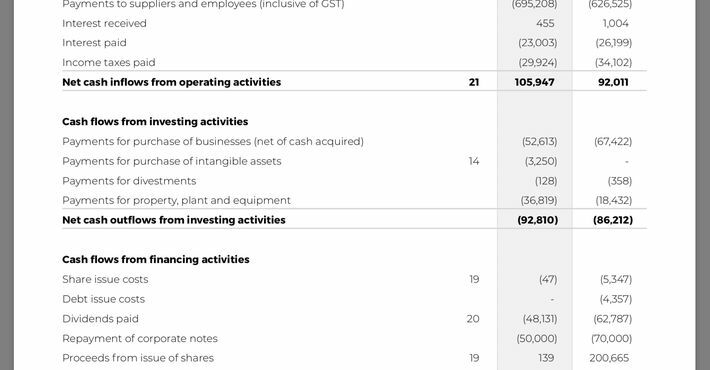 GEM are still spending beyond their means with profits declining despite increasing revenue, all whilst taking on more debt in order to recklessly continue paying out dividends to shareholders. This company is destined to go broke if it keeps this up. I thought i’d do a more detailed post on GEM and some of the fundamentals I look at and some possible red flags I try to avoid following on from a comment I made on a post earlier this week. G8 Education listed back in 2007 and their share priced reached a low of around 7 cents in early 2009 after a couple of unprofitable years during startup. In 2010 they became profitable and their shares subsequently started to rise from around $0.50/share at that time up to an eventual high of $5.63/share in Sept 2014. During that period, GEMs earnings per share rose from 4 cents in FY10 up to 18 cents at the end of FY14 which is a 350% increase over 4 years (not bad). Over the same period, GEMs share price increased 1026% so share price growth significantly outperformed earnings growth as the PE multiple (price to earnings) expanded from 12X to 31X putting high expectations on future earnings growth. From late 2014, GEMs share price started to decline even though earnings continued to grow for another 18 months to reach an eventual peak of 25 cents/share in December 2015 so why did the share price start to decline 18 months prior to the peak in earnings? 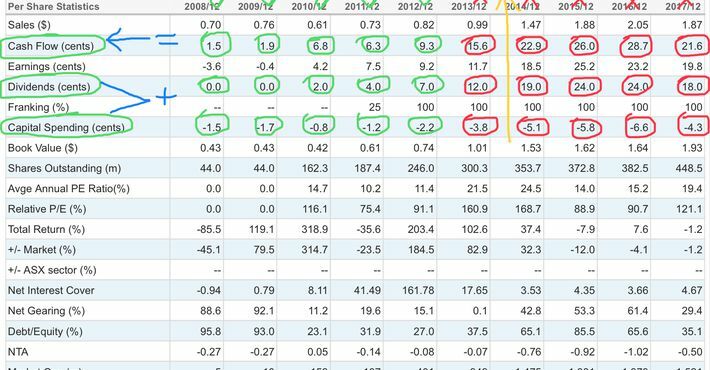 If we take a closer look at the historical financials in the table below you can see that I’ve highlighted cashflow, dividends and capital expenditure. The first thing I look at when evaluating profitable companies it the cashflow number. On average, Cashflow should equal or exceed the amount paid in dividends AND capital expenditure combined. I.e. if we look at 2012, cashflow was 9.3 cents/share, Dividends (7 cents) and capital spending (2.2 cents) totalled 9.2 cents/share which is slightly less than cashflow which is good. Any excess cashflow can be retained by the business to pay down debt or invest in growth or capital management initiatives which should benefit shareholders. If the cashflow number is LESS than the combined amount used for dividends and capital spending like it was from 2013 onwards (marked in red below) then this is a red flag - especially if it continues over multiple years. In this situation, the company must make up the shortfall by either increasing debt or raising capital via the issue of new shares (or through dividend reinvestment plans). If you find a stock that looks cheap with a high dividend yield then this is the first thing you need to look at to see if that dividend is sustainable (TLS is another good example of this “red flag”). It’s not unusual for some companies to be spending more than the cashflow amount during periods of growth when buying businesses or building a new mine for example, but, you would not be expecting those businesses to be paying out high dividends during that same period, particularly if they are having to raise capital or take on high levels of debt to fund that growth. This is where GEM management failed shareholders by trying to keep shareholders happy with big dividends whilst having to take on tens of millions in additional debt each year to fund growth and acquisitions. To highlight this, GEMs debt increased from $14M in 2010 to $410M in 2016 and during the same period The number of shares on issues increased from 162M to 382M. GEM ended up having to issue another 66M shares last year just to pay down some of that debt pile AND had to cut the dividend. From 2010 through to 2017 GEM have paid out more than $400M in dividends! Had GEM been more prudent with their capital management they could have reduced the amount paid in dividends to a sustainable level and retained some of that cashflow to fund growth and kept debt levels much lower and probably also avoided the need for last years dilutive capital raising. The first red flag appeared in the numbers from 2013 and by 2015 the writing was on the wall as dividends and capital spending were rising faster than cashflow and the share price had already started to price that in. This is a great article for anyone- like me 😜who has fallen into the G8 Education value trap. Top fund managers on their hits, misses and big themes from earnings season. Some good ideas of stocks to consider from this, but also where the risks are. The astronomical valuation multiples that tech stocks like Wisetech Global are trading on are singled out as a bubble waiting to burst, especially in a market of rising interest rates where momentum in the stock market could easily lose steam. I love the fact Wilson Asset Management are big believers in Specialty Fashion Group- which I got into and did well off following their great result last week. Blindsided again today- this time by G8 Education. Their result today confirmed that structural challenges in the childcare industry from oversupply continue to persist and this has materially impacted profit and the future earnings outlook of the business. Price fell 16%. I had bought in off the back of their investor presentation earlier in the year where they said whilst oversupply was an issue, they expected an increase in demand, driven by government subsidies to childcare. They painted a very optimistic business outlook, making the price seem cheap based on a dividend yield of over 8% that the stock was trading at, at the time. I am beginning to learn that CEOs are paid to be an ambassador of the company. As well as running the business, they are paid to sell a great story to the market and because of this, they often believe their own BS!! I therefore need to be more careful next time to be more critical of the rosy picture they almost invariably portray in their presentations, particularly when the stock price seems cheap. Going forward I’m going to pay more attention to where the top institutional investors are putting their money- as I had heard they were all avoiding G8 like the plague because they believe their childcare centres aren’t in great locations. 22 May 2018 NABtrade interview with Gary Carroll, CEO of G8 Education providing an overview of the business, how its managed at a centre level, its strategy to differentiate itself, key business risks and his background. The small end of the market where I tend to concerntrate has run out of steam from the highs in Jan. Lithium, blockchain and med Canibus stocks have failed to resume the highs at start of the year. Blue chips are also in trouble - banking commission dragging down Big 4 & Telstra doesn’t look set for a recovery any time soon. General market conditions continue to be bullish - low wage growth and slowing property market will defer any interest rate hikes till next year. Thinking mid caps will see the best gains over short to medium term. GEM - child care - 95% of customers better off under the new gov means testing package. SHV - almond producer - low AUD and maturity of orchards may lead to continued growth. Hedge against trade war with US & China given California produce majority of global almond market. SLK - tourism should continue to be strong and they just announced declining to consider a take over offer as see future growth. AAD - recovery from dream world disaster, just sold AMF bowling to strengthen balance sheet and expand Main Event business in US. NWH - mining and civil works. Currently building Perth airport rail link - may get deals with increased gov infrastructure spend. I welcome any thoughts on above list or other mid caps that may run in current market conditions. I just bought a small parcel of shares in G8 Education. The stock has been smashed 50% since its November 2017 Annual General Meeting. Earnings growth has been contained by industry supply of childcare centres outweighing demand, which has negatively impacted their occupancy. However, as a result of the share price falling as much as it has, the stock is now trading on a p/e multiple of around 11x and if all or most of its earnings are paid out as a dividend- which it has done historically- then I reckon the dividend yield could be as high as 8.5%. Its balance sheet doesn't look overly geared either which should allow them to pay out a good dividend. The share has bounced 6% today following a trading update and presentation at a Macquarie Conference. It could come back off some profit taking, but in my view its a good entry point given the attractive multiple and dividend yield and now positive share price momentum.